Here are two useful charts and a link to the flowchart for Feverish illness in children. 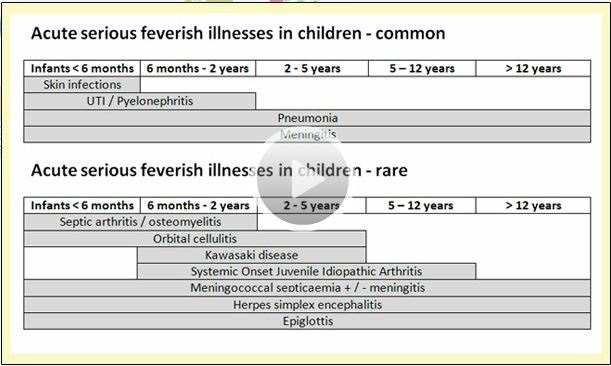 The first from www.spottingthesickchild.com and is a list of the causes in fever in children by age. 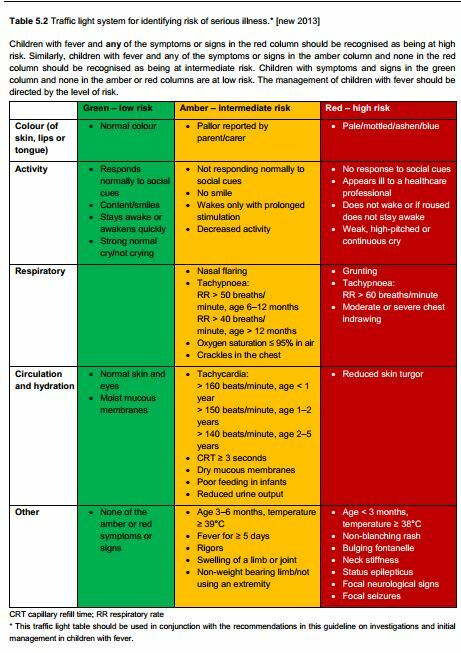 And the second is the Traffic Light System from ‘Feverish illness in children’, NICE clinical guideline 160 (May 2013) which helps you recognize how sick the child is. You can print out the pdf of the Traffic Light System here. And finally the third resource is the flow chart for Feverish illness in children. It is simply outstanding and worth reviewing in its entirety perhaps every few months. The Spotting the Sick Child site is an outstanding (relatively) brief review course of acute pediatrics. The course is free with registration and is clearly worth it. And below is the traffic light system for recognizing serious illness. This entry was posted in Emergency Medicine, Guidelines, Infectious Diseases, Pediatrics. Bookmark the permalink.